Thank you for responding to our Invitation to Be Invitational. Clearly you are not interested in doing so. The notion that the work of The Commission is transparent appears to us as delusional. Press releases and formulaic videos are not the same as “transparency.” Apportionment dollars used to pay for armed, local law enforcement to protect you from us does not qualify as Invitational nor Transparent. If there is a group of persons with more of a stake in The Commission than Love Prevails, we would like for you to tell us who they are. The very existence of this Commission is in response to the pressure applied across the denomination by Love Prevails and other LGBTQ groups and advocacy allies. In light of your statement that the Commission’s work is, in fact, transparent, we ask you for the following information. 1) Your list of the stakeholders in the Commission, the individuals or groups you have identified as having a stake in the outcome of the Commission’s proceedings. 2) Is our being invited to the meetings of the Commission a decision you are authorized to make? The Commission as a whole? The Council of Bishops? Since your response had no mention of our being welcome or who is responsible for excluding us (or others who might attend), please clarify. 3) Descriptions of the general content of each meeting of the Commission before, during and afterwards. 4) When will the Commission be out of its “early stage” and be mature enough to invite others into its life? Was the video a misrepresentation of the trust-building it portrayed? 5) What is your communication plan to bring the rest of the church along before some great reveal in an Advance DCA for 2019? We will be publishing your email communications with us on social media going forward. We look forward to your utmost transparency. 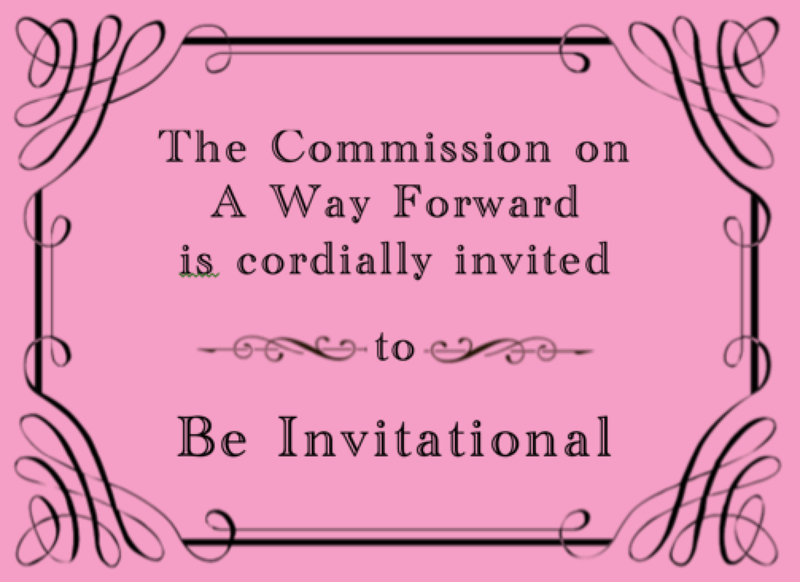 Here is the original email Invitation to Be Invitational that Love Prevails sent to every member of the Commission. Greetings as you prepare for your next Commission on A Way Forward. Love Prevails is still awaiting more transparency from the Commission. As a result, we are formally inviting you to invite more to be present with your deliberations now that you have established your trust with one another. We hope to hear your RSVP will allow ourselves and others to come in from both the cold and the heat. We are aware that you may still be remembering our identity of being disruptive for General Conference 2016 as all other avenues than direct action have been removed from LGBTQ persons actually being at decision-making tables. We are quite capable of honoring an agreement to be non-disruptive witnesses at your meeting in the Chicago area. We invite you to read our attached invitation and hope to hear from you soon that your self-imposed wall will be dismantled from the inside. Bishop Ken Carter responded with the following email response to Love Prevails’ Invitation to Be Invitational, addressed to Rev. Wesley White, who sent the emails on behalf of Love Prevails. Thank you for reaching out to us. We continue to do our work for the sake of finding a way forward and we are at an early stage in this mission. We are also in continuing communication with United Methodist News Service and are transparently listening and sharing with stakeholders across the church. Note: The following is a letter from Rev. Jim Todd, Rev. Dr. Julie Todd’s father. The letter has been used to raise funds for Love Prevails in New England, but the LP team believes it is powerful enough to be shared across all forms of media. Enjoy this beautiful expression of inclusion, and if you are financially able to end your year with a gift to Love Prevails, please do so here. My daughter, Julie, has committed many years of her life making sure the doors of the United Methodist Church are open to LGBTQ people. I do not understand, in this day and age, the United Methodist Bishops, pastors and lay people who refuse to fully open the doors and welcome “ALL” into the community of faith, including pastoral appointments. The UMC, as we know it, is becoming increasingly irrelevant as a backward, punitive and judgmental organization. For the last couple of years Julie has worked closely with Amy DeLong (both UM clergy) to right the wrongs and fully open the doors of our denomination. 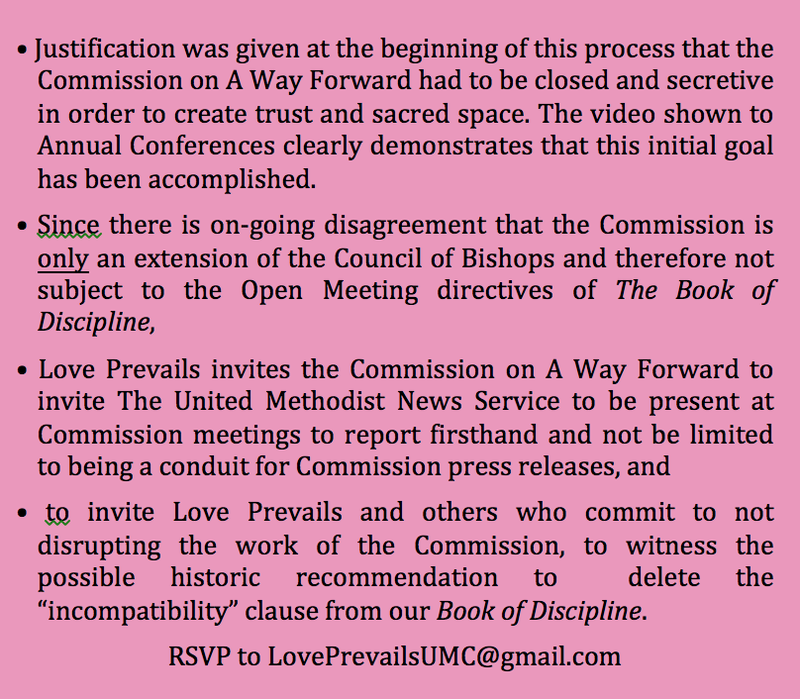 During these years, they have “showed up” when the Bishops and the Connectional Table meet to promote their agenda of truly “open doors” Their organization, “Love Prevails” – www.loveprevailsumc.com – and their Facebook page tell the story. 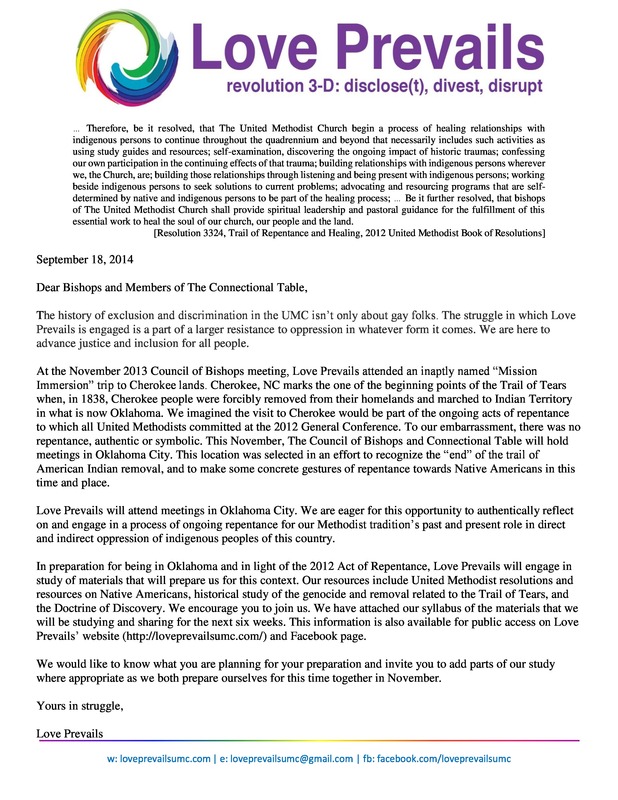 At a recent gathering of the Bishops and Connectional Table in Oklahoma City, Love Prevails members were constantly harassed by United Methodist staff. They were seen as troublemakers and locked out of meetings. Police and hotel security were called by church leadership for no good reasons. I am embarrassed and angry that our denomination has treated Love Prevails members the way they have. The Bishops do little or nothing to open the doors because they claim they “need to keep unity and serve the whole church.” Is this the same reasoning our denomination used when people of color and women were denied full rights? Mary and I regularly provide financial support for Love Prevails and their efforts to open the doors of the UMC for full inclusion (including ordination) of LGTBQ people. For 40 years they have been left out of full participation. How can we, as Christians, accept this United Methodist policy and foot-dragging? This restrictive policy can be changed only every four years. I strongly believe if Jesus were to attend the 2016 General Conference in Portland, OR, he would support such a change. So why am I sharing all this with pastors and reconciling congregations? I am inviting you to financially support Love Prevails and their prophetic stand. It is not only because of Julie’s involvement, but that is a motivating factor, for sure. It is because you can help Love Prevails “show up” and make a difference. You can make a tax deductible donations toward a $9,000 matching grant. Kairos CoMotion (www.Kairoscomotion.org), is the 501(c)3 financial sponsor of Love Prevails. Mail your contribution c/o Margaret Talcott, Treasurer, PO Box 45234, Madison, WI 53744, or go to their website and contribute through PayPal. I hope you will seriously consider joining me with your own financial contribution to help the UMC become a more inclusive church where ALL people are valued. Join the Love Prevails 2014 Native American Study as we engage in larger resistance to oppression within the United Methodist Church. 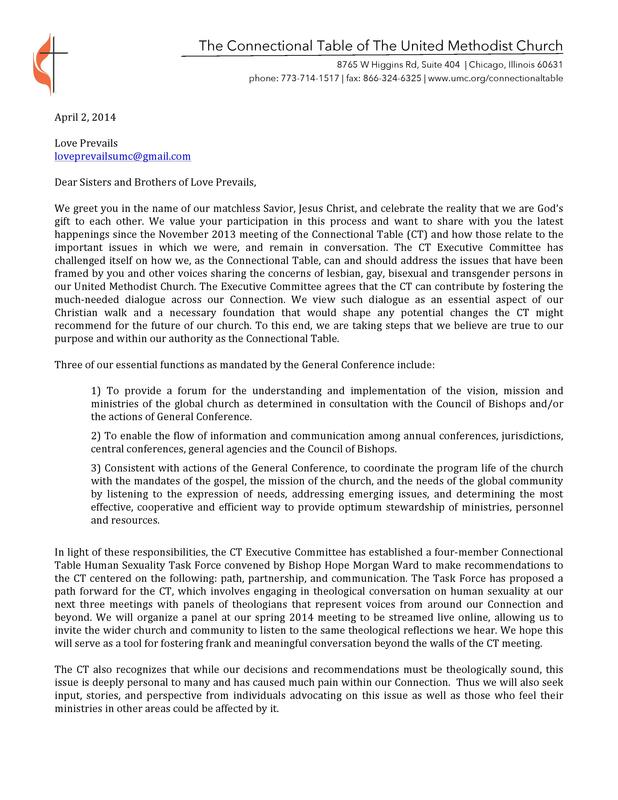 For more information check out the tab above and please read the letter sent to the Council of Bishops and Members of the Connectional Table below for more information. Spirit Speak, a video project out of the Rocky Mountain Conference, Discloses “stories affirm that Lesbian, Gay, Bisexual, Transgender, and Queer persons should be joyfully embraced as members of the body of Christ and as gifted children of God entitled equally to all of the ministries, ceremonies, and sacraments of the United Methodist Church.” Watch this, Spirit Speak’s first major video production, and share widely. “The tone and content of your letter to us signaled a distinct shift away from the spirit-filled riskiness we experienced when we were with you and back toward institutional security. The steps forward that you outlined have been tried repeatedly for the past 40+ years and have proved inadequate.” This was our response to the first letter the Connectional Table sent to Love Prevails in December 2013. We have since exchanged two more letters. 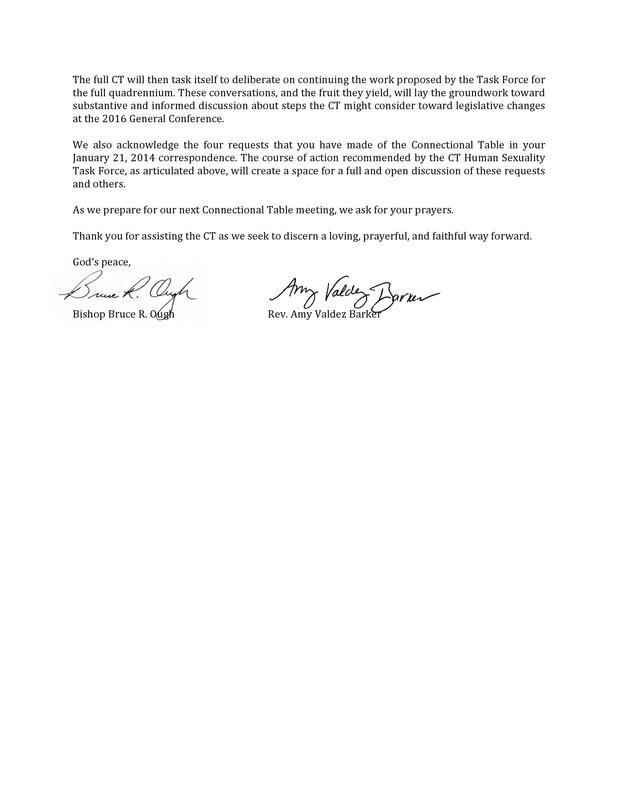 Here is the latest letter from the CT to Love Prevails earlier this month. Their response remains fundamentally the same: inadequate and shifting away from spirit-filled riskiness. We look forward to our encounter with the CT in Chicago at the end of the month.